Pair of Ari chairs with one ottoman by Arne Norell. Made in Sweden circa 1970s for Norell Mobel AB. Very good condition. No condition issues. Sculptural form lounge chair by Edward Wormley for Dunbar. Restored and reupholstered. Dunbar espresso tone frame with cane back. New blue velvet upholstery. 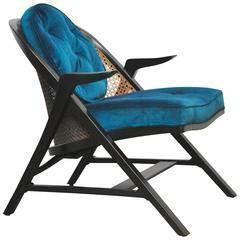 Lounge chair designed by Edward Wormley for Dunbar. 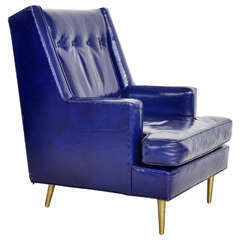 Original blue leather over brass legs. 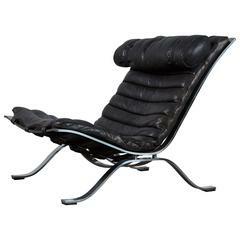 Leather and chrome &quot;Ari&quot; easy chair by Arne Norell. Made in Aneby, Sweden for Arne Norell AB, circa 1960s.